The track has existed since at least the 1960s when the Bucks Champs were held here. 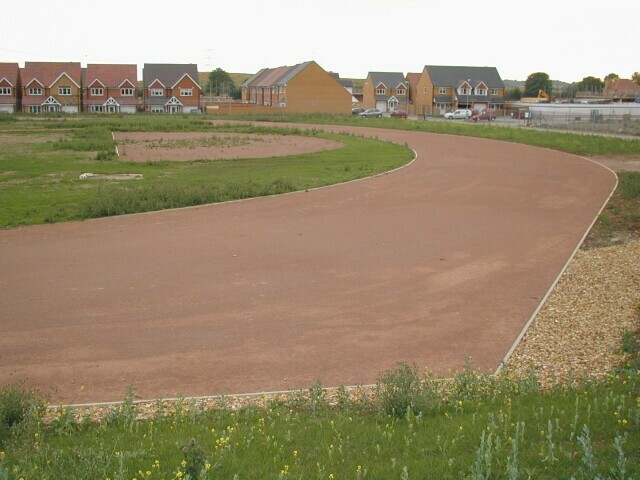 It used to be a redgra one and was formerly part of RAF Stanbridge which was part sold off in 1999 and the part including the track has been developed by Beazer Homes and others for housing and the new estate is called Billington Park. The builders were responsible for ensuring that it is left in a usable state and by the summer of 2001 the work to restore the track to a usable state had been completed. The track and all the runways were resurfaced and the curbs renewed. The old PV runway inside the top bend was converted into a LJ runway although at the time of visit (July 2001) there was no board. The track is thought to be still 440y. The track was not however used by the host club until 2002 due to contractual problems. The track is thought to be managed by Leighton Linslade Town Council. The track is prone to weeds and a strong weed killer is needed to keep them at bay.